Check out the fun new Packit colors for 2013! Owls, Lightning Green, Ikat, and Cali Stripe are a few of our favorites here at As Seen on TV Web Store. 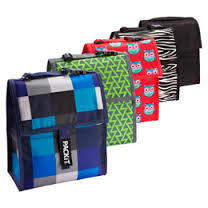 Packit is the Freezable Lunch Bag, As Seen on TV, that was created by moms a few years back and have become a household staple for kids’ lunches across America. My own kids use theirs for lunch everyday at school, and now summer camp. My husband takes his to work everyday, as do I. We use Packit at the beach, for hikes, bike rides, road trips, amusement parks, picnics, the park, pretty much whenever we are on the go and need food on hand. Even in the Florida heat, where we live, Packit keeps our food and drinks nice and cold. My husband and I laugh and ask “what did we do before Packit?”. We really use ours ALL the time! Packit also makes the perfect baby shower gift. The expecting moms I know always get one from me, and they love it! Do you have a Packit? Let us know how you like to use yours!